Rotocone Vacuum Dryer (RCVD) is suitable for drying of materials which cannot resist high temperature, material which is easily oxidised, volatile materials which should be retrieved, materials which are strong irritants and poisonous in nature. RCVD with the improved technology integrates during operation under vacuum. The RCVD facilitates enhanced drying efficiency, low-temperature operations and economy of the process by total solvent recovery. It helps cGMP based working by achieving optimum dust control while offering advantages of efficient charging and discharging of materials. 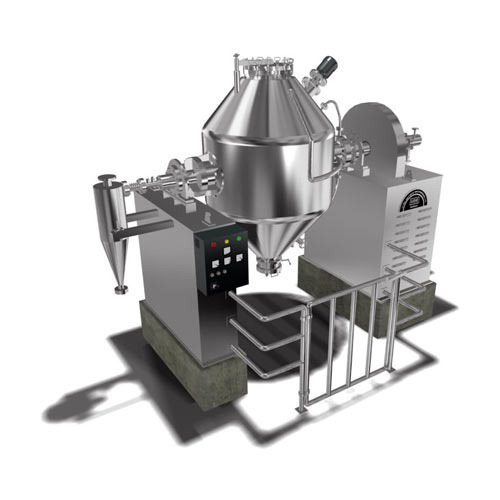 The drying unit equipped with lump breakers initially breaks large lumps and subsequently powders them (in a single cone). The rotary action of the dryer together with the mechanical action of the breakers cuts down drying time and gives a lump-free product. Vihar Engineering is a prominent name among manufacturers and exporters of a comprehensive range of pharmaceutical packaging machinery and cosmetic packaging machine. Committed to achieve 100% customer satisfaction, our pharmaceutical and cosmetic packaging machines are superior in quality & are suitable for small as well as large scale production and packaging applications.